Here's a collection of some of my favorite maps of Chicago, from the historical to contemporary takes. I love the way the city formed. The city in its current form has a beautiful, orderly pattern of streets that radiates out from a core. I wanted to present some of the early maps of the city, where the first seeds of settlement happened, and present a chronology of illustrated maps. Early cartographers showed the growth of the city from its origins at the Chicago River and its fork. Later cartographers and artists took liberties in showing the cityscape in different ways, highlighting certain elements like new transit lines, parks and boulevards, and modern aerial views. Hope you enjoy getting these bird's eye views of the city's history and growth. NOTE: If you want a closer view of these maps, right-click on the image and select "Open image in new tab." That will allow you to get an expandable view of the image and a better look at the details. Map of Chicago in 1812. Source. 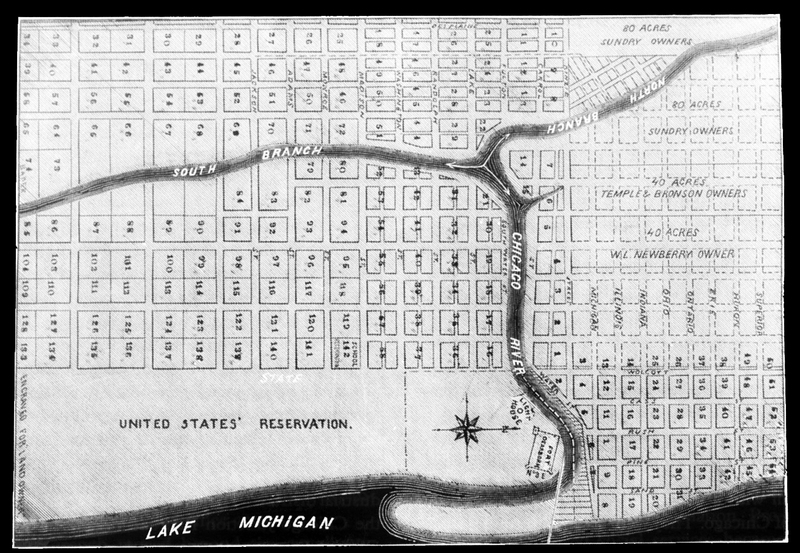 The original 1830 subdivision by the Illinois and Michigan Canal Commissioners. Source. "Map of Chicago, Incorporated as a Town August 5, 1833." Walter Conley & O.E. Stelzer, 1933. Source. Chicago In Early Days. 1779-1857. Kurz & Allison, 1893. Source. Lithograph by Christian Inger, based on a drawing by J.T. Palmatary. Published by Braunhold & Sonne. 1857. Source. Chicago, Chicago Lithographing Co., 1868. Source. Currier & Ives. ; published in Harper's Weekly (1 August 1874) Source. Richard’s Illustrated and Statistical Map of the Great Conflagration in Chicago. 1871. Source. The City of Chicago / sketched & drawn on stone by Parsons & Atwater. Currier & Ives, publisher. 1874. Source. Guide map of new Chicago and suburbs. Author Stine & Clark,1889. Source. "Bird's eye view of Chicago, 1892." Roy, Peter. Source. "1893 Grand View of Chicago." Treutlein, Th. Eagle Lithographing Co. Reynertson & Beckerman, 1893, c1892. Source. "Bird's eye view of the World's Columbian Exposition, Chicago, 1893." Rand McNally and Company. Source. Library of Congress illustration of the official birdseye view of the World's Columbian Exposition in Chicago, Illinois in 1892. Source. Bird's-eye-view of the business district of Chicago. Poole Brothers, c1898. Source. Birds-eye view of the elevated railroads and the parks and boulevards of Chicago. Willis J. Champion, 1908. Source. "Chicago. View Looking West over the City, Showing the Proposed Civic Center, the Grand Axis, Grant Park, and the Harbor," (Jules Guerin). Plan of Chicago, published by Chicago architects Daniel H. Burnham, Jr. and Edward H. Bennett, 1909. Source. Chicago, central business section. Reincke, Arno B. 1916. Source. Map Showing the Territorial Growth of Chicago. Chicago Department of Public Works, Bureau of Maps and Plats, 1930. Source. An Illustrated Map of Chicago, Youthful City of the Big Shoulders, Restless, Ingenious, Wilful, Violent, Proud to be Alive! Charles Turzak, Boston, 1931. Source. A Map of Chicago's gangland from authentic sources: designed to inculcate the most important principles of piety and virtue in young persons, and graphically portray the evils and sin of large cities. Bruce-Roberts, Inc., 1931. Source. A Century of Progress, 1833-1933 : Chicago World's Fair Exposition. Reuben H. Donnelley Corp. 1933. Source. Chicago. The Greatest Inland City in the World. Colortext Publications, Inc. 1938. Source. Map illustrating the dominant ethnicities of different areas of Chicago in 1950. City of Chicago Department of Planning and Development. Source. Chicagoland Panorama. Homer Goodman. Published by: Chicago Association of Commerce and Industry. 1964. Source. Map of Hyde Park and view north. Lauren Nassef. 2007 [circa?] Source. T.S. Shure Map of Chicago Magnetic Playboard and Puzzle [2010?]. Source. Map of Roscoe Village: A Neighborhood of Chicago. Joe Mills. [Contemporary] Source. Chicago Neighborhood Map. Ork Posters [Contemporary] Source.